With all of humanity’s assaults on life these days, amphibians are having an especially challenging time. So it’s a relief to see a healthy crop of tadpoles in our pond again this year. Either way, I’m delighted to see the tadpoles thriving (or at least, the ones that didn’t go down the throat of the duck that visited this morning). It’s also gratifying to have rain today, as the water level in the pond has been dropping rapidly. 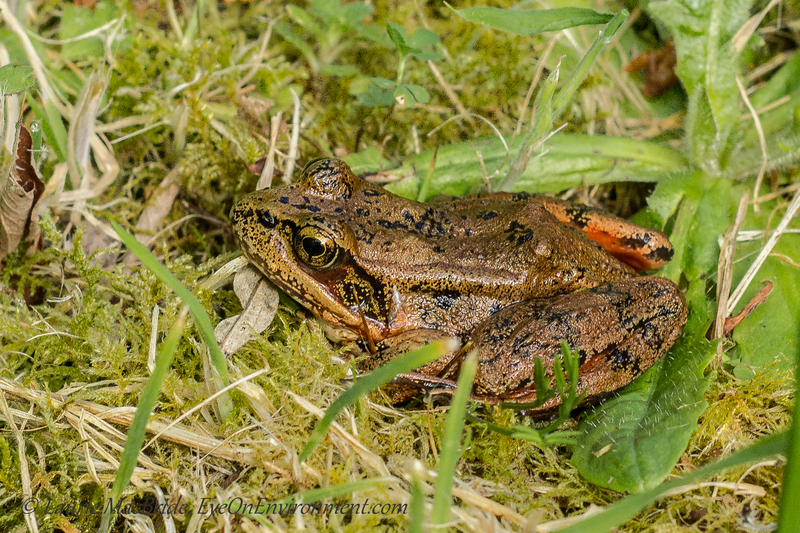 Early summer is a race against time for the young amphibians, as they work at growing the legs and lungs they need in order to leave their watery world and fan out to our garden and the surrounding forest. A few times in the past we’ve resorted to “tadpole rescue”, catching the little guys in buckets and carrying them down to the lower pond or creek where there was a bit more water to be found. This year I’m hopeful that no intervention will be needed. If you’re on Gabriola Island this summer, I hope you’ll check out my photography show, “Inspired by the Coast”, at the Silva Bay Restaurant & Pub. Open every day – and the food is excellent! 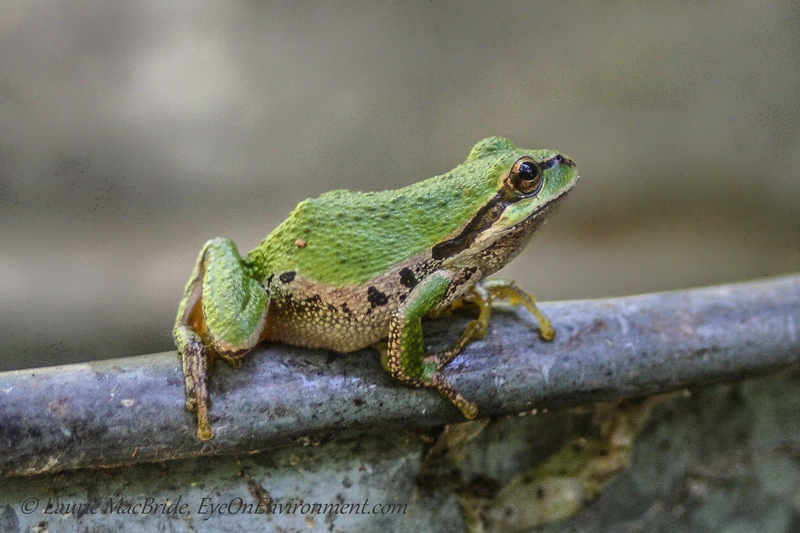 Posted by Laurie MacBride, Eye on Environment on June 27, 2014 in Amphibians, Animals & Wildlife and tagged frogs, nature, photos, ponds, species at risk, summer, tadpoles, wetlands. Love to see all the wonders in your particular eco-system Laurie! Go frogs! Thanks Sherry! 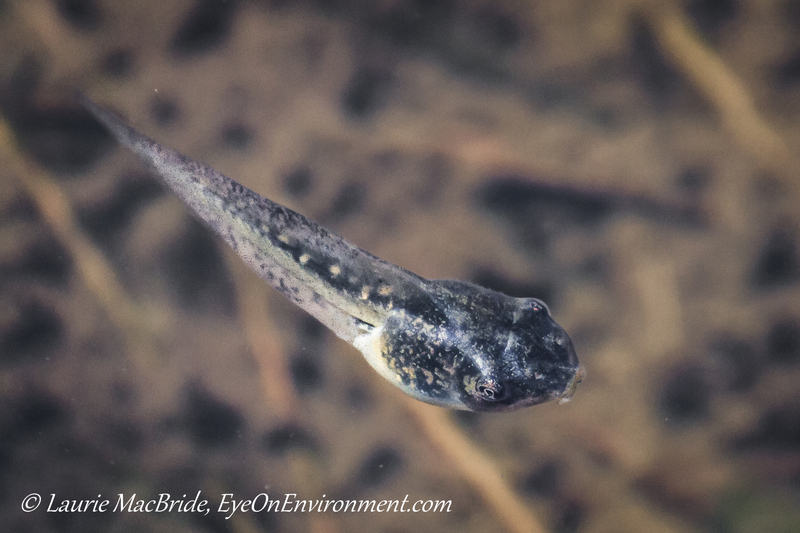 We had another couple of days of rain since I wrote that post, which has likely been helpful to the tadpoles. I’m hoping they’re now “launched” into their adult form, since the forecast for the next week is warm and sunny. Fortunately herons don’t come to our little pond very often, but we do get ducks and sometimes a raccoon. Thanks for the comment, Joseph. Hope you have made it safely through the big storm you were expecting. Your photos are quite amazing, and yes I think we are all pull for the frogs knowing we are next. Thanks for your kind words, Charlie. I agree, we need to do whatever we can to help the frogs and the rest of our very precious and irreplaceable ecosystem.